Uncle Choy is like the Nick Fury of HK comic books. He is an old cat, but all kinds of tough. His comics were published from the late 1950s into the early 1970s, but they really found their stride when the veteran Republican era military doctor started taking the fight to the Imperial Japanese and their cringey figurehead, last Emperor Pu Yi. 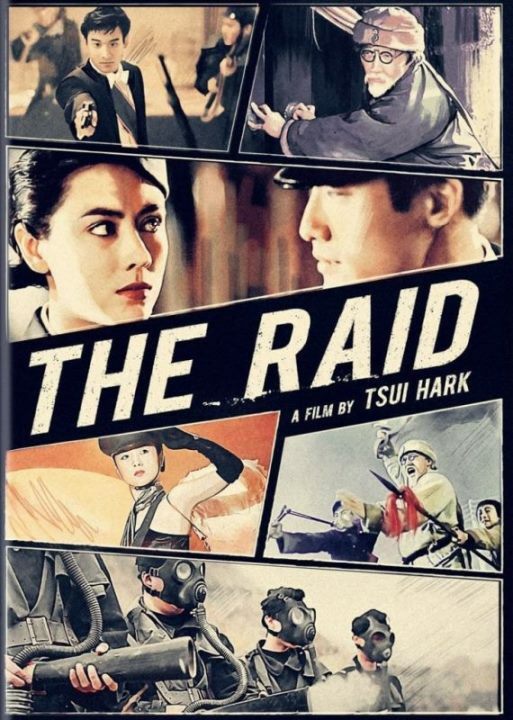 The good doctor uncle will indeed heed the call of patriotism in Ching Siu-tung & Tsui Hark’s The Raid, which releases today on DVD from Well Go USA. Since Uncle Choy is a comic book character, he will get comic art for his opening credits and transitions in the Creepshow tradition through the film. Uncle Choy carries garlic and red pepper for medicinal purposes and dynamite for emergencies. Unfortunately, he cannot save the colonel ailing from a Japanese poison gas attack. However, he can make jolly well certain it never happens again. Initially, the dedicated Lt. Mang does not understand how handy Uncle Choi is have around, but he will soon learn to appreciate his resourcefulness. Likewise, Choy have reason to thank his young adopted niece Nancy for disobediently trailing him, just as she will be happy her Oliver Twist-ish admirer invited himself along. Choy’s misfit commandos will finally reach full strength when they rendezvous with Mang’s spy in Pu Yi’s camp, Tina, a.k.a. WO-1 and the smitten junior warlord Bobo Bear, who joins up to impress her. Together, they will challenge the schemes of the local Japanese commander Masa and the treasonous movie star Kim Pak-fai. Ostensibly, she is the puppet emperor’s mistress, but she is betraying him and her country with Masa. There is a good deal of physical humor in The Raid, but happily, it is much cleverer and far less shticky than one might fear. Ching (the action director on the Tsui-produced New Dragon Inn) and Tsui never water down their fight scenes with slapstick foolishness. They recognize there is a time for comedy of errors and a time for getting down to business. Although he was only forty-two at the time, Dean Shek is remarkably convincing as the crafty old uncle. He balances to comedy and his unlikely action smackdowns quite adroitly in his final screen appearance before his early retirement. He also seems to forge a comfortable rapport with almost the entire ensemble, except perhaps the “Big” Tony Leung Ka Fai’s gleefully moustache-twisting, unapologetically villainous Masa, with whom he rarely shares screen time. Jacky Cheung is also appealingly earnest as Bobo Bear, but Fennie Yuen upstages nearly everyone as Tina, the film’s smartest character by far. As Tsui fans would expect, there are some big, suitably chaotic set-piece sequences in The Raid, including a crazy bit of business involving a plane that prefigures the conclusion of The Taking of Tiger Mountain. In many ways, it is like a live-action cartoon, but Ching and Tsui maintain a vibe of rugged camaraderie that is pleasantly distinctive. It is a fun film that holds up quite well for action connoisseurs twenty-four years after its initial theatrical release. Recommended for fans of Hong Kong film, The Raid (not to be confused with the Gareth Evans franchise) is now available on regular DVD, from Well Go USA.